For some reason I’m suddenly getting lots of messages about my theory that Hamas murdered Ismail, Mohammed, Ahed, and Zakaria Bakr and used their corpses in an elaborate deception operation on July 16, 2014. You need much better arguments than this. Total incoherence. I can’t understand what was written. At least this next one makes sense. 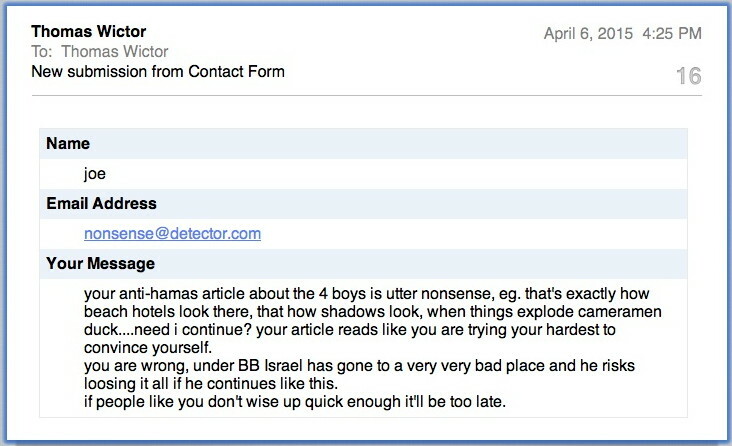 Personally I have no problem accepting that the Palestinians are able to carry out sophisticated deception operations. Their job is made much easier by a compliant media and a Jew-hating world. However, if you’re going to take issue with my theory, you need to disprove some actual facts. We’ll dispense with all the speculation and stick to only the things we know for sure took place. If you can’t rebut these points, it means that my theory is correct. 1. The first explosion was not an Israeli strike. NBC News captured the sound of the first explosion. You can hear it at 1:23. The camera was in the al-Deira Hotel, about 328 yards (300 meters) from the breakwater where the four boys were said to be playing. You can see the window of the hotel room shake. 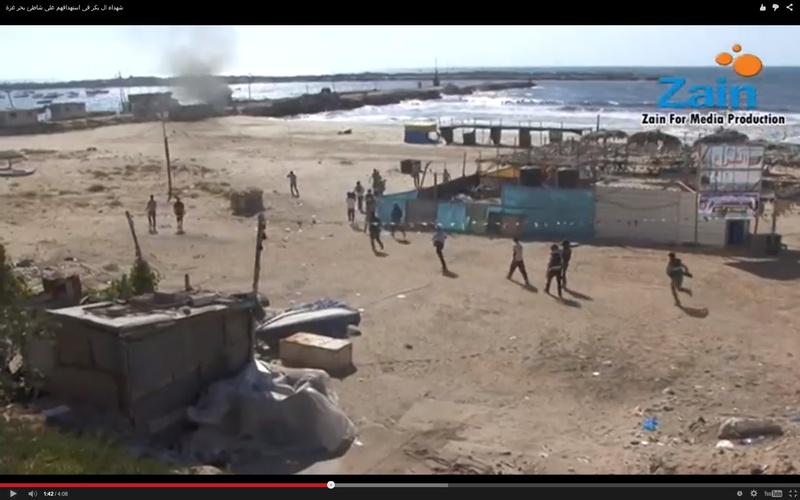 In this screen grab, the red arrow marks the steel container that was later struck by an Israeli air-to-surface missile. What caused that first explosion? I know the answer, but those of you who say I’m just a nutty conspiracy theorist must explain what happened. 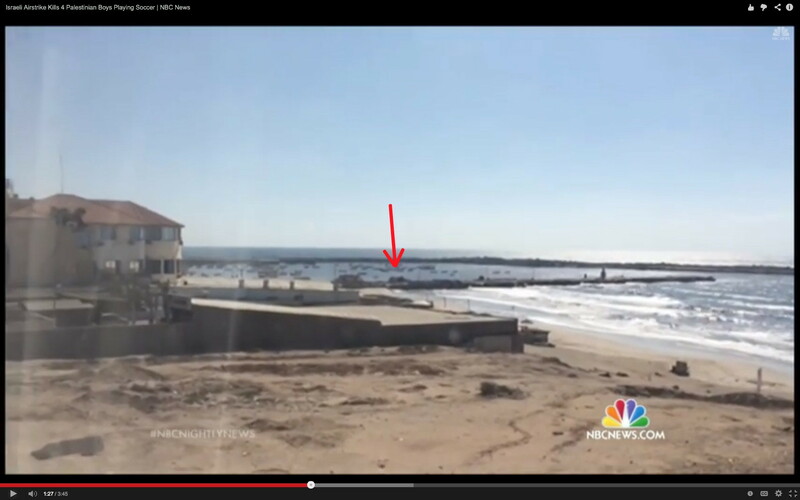 As you can see, neither the breakwater nor the beach were hit. You tell me what made a large enough explosion that it would shake a window pane several hundred yards/meters away. 2. 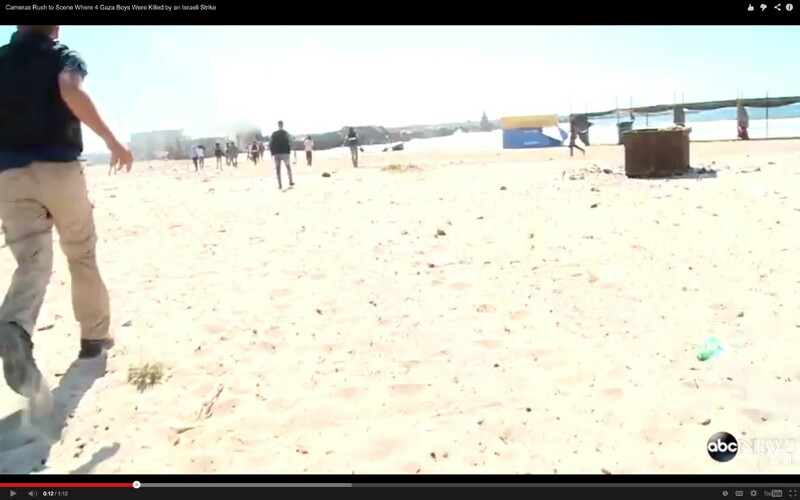 All the western reporters say they ran to the beach immediately. 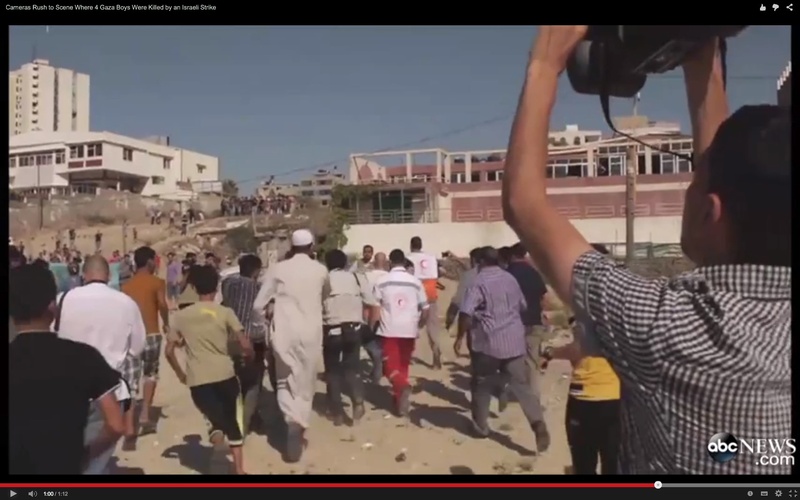 ABC News filmed the area where the bodies of Mohammed, Ahed, and Zakaria Bakr were recovered. When Alex Marquardt sprinted through that precise location, there were no bodies present. 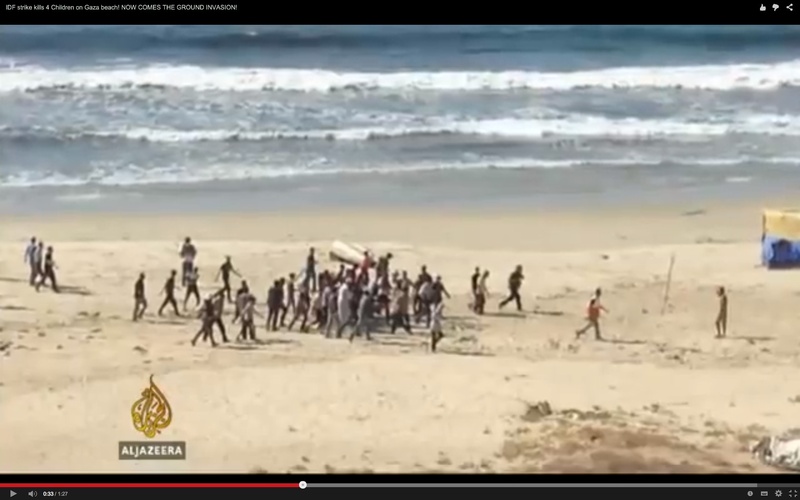 When Zain for Media Production filmed the arrival of the western reporters, there were no bodies in the sand. Stephanie Dekker of al-Jazeera photographed the removal of Ismail Bakr’s body. The procession walked right past the place where the three other bodies were found. When ABC News filmed the removal of Ismail Bakr’s body, everyone walked right past the place where the three other bodies were found. If three three boys were killed by an Israeli missile strike before the reporters arrived, where were their bodies? Some people tell me that the bodies of Mohammed, Ahed, and Zakaria Bakr were removed from the beach before the western reporters arrived. That’s not true. We have video evidence that two ambulances parked at the corner of the Avenue Restaurant and Coffee Shop after the explosions and waited for an undetermined amount of time. 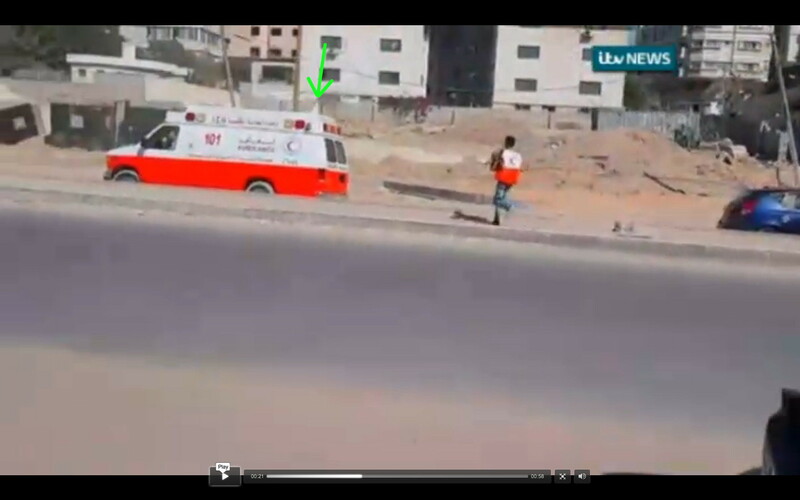 And this is the ambulance that went to the al-Deira Hotel for Motasem-Muntaser and Hamad Bakr. The green arrow marks a small flag. This vehicle was parked across the street from the ambulance that picked up Mohammed Bakr. Why did those two ambulances wait at the corner of the Avenue Restaurant and Coffee Shop? All the western reporters said they ran to the beach immediately. 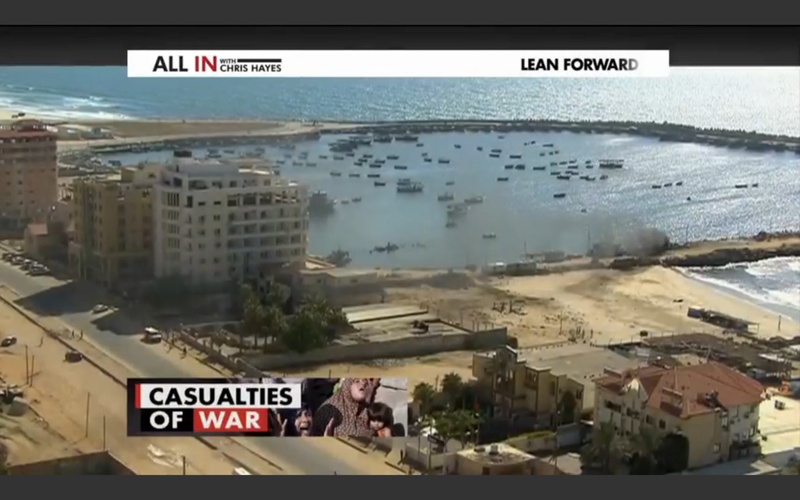 They were staying in the hotels you see in the MSNBC screen grab. Do you think those two ambulances arrived, parked, and waited, and then one drove forward to receive the body of Mohammed Bakr, and a third ambulance arrived to collect Ahed and Zakaria Bakr—all of that taking place before the western reporters ran to the beach? 3. The 24 Media Production Company photos that show the four boys running are fake. They were created beforehand. We know they’re fake because Stephanie Dekker’s photo shows smoke billowing from the steel shipping container. In this photo allegedly taken about one second later, there’s no smoke coming from the steel container. It would not have been possible to create these composite images in one day. They were made sometime between July 10 and July 15, 2014. If you think the 24 Media Production Company photos are real, why is there no smoke from the shipping container? 4. Nick Casey of the Wall Street Journal tweeted that he found the bodies of two adult males in the rubble on the breakwater. Casey deleted his tweet without explanation. No other media outlet on the planet reported that two adult males were also killed on the breakwater, July 16, 2014, and none of the “surviving” children made any mention of men being with them. 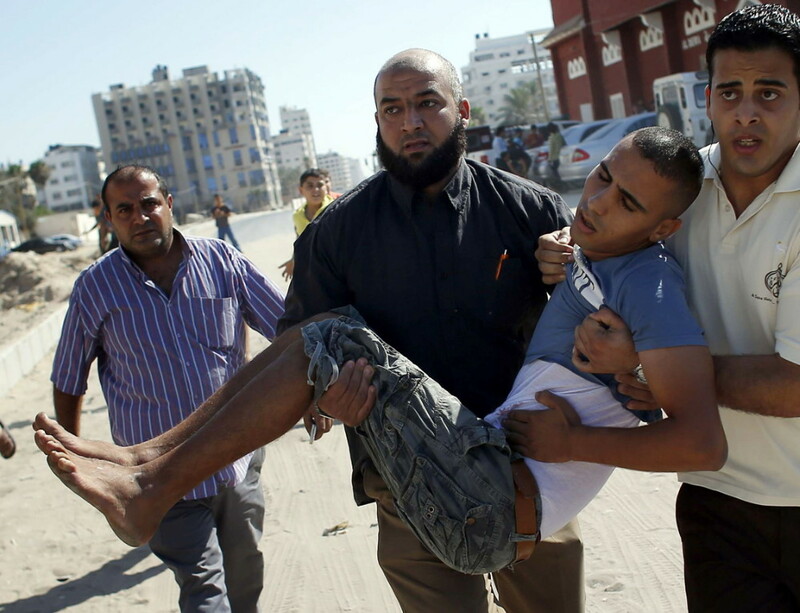 However, the IDF said that it targeted Hamas terrorists at that location. Who were those two men, why did Casey delete his tweet, and why did none of the other journalists on the breakwater report seeing them? 5. 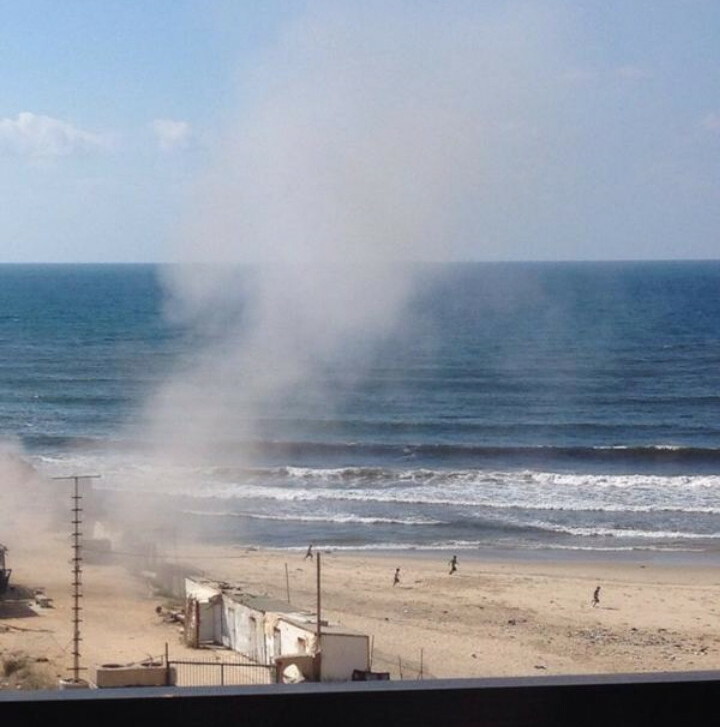 The 24 Media Production Company photos show the explosion of a munition on the beach. The column of smoke indicates the use of an impact fuse, not a proximity fuse. 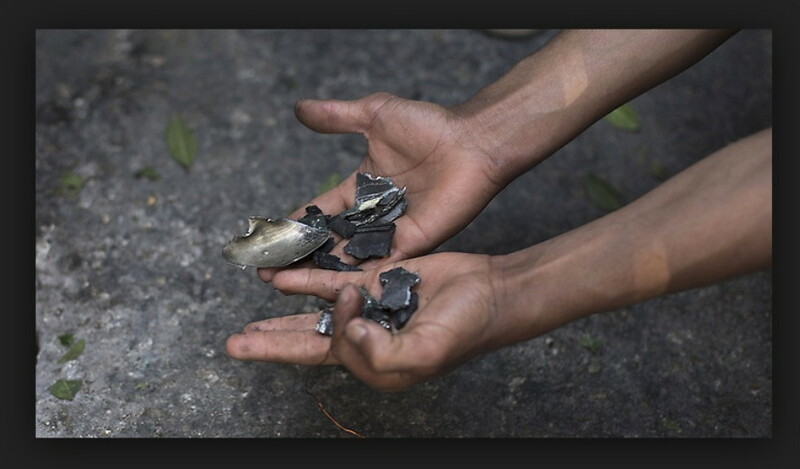 That means the munition detonated when it hit the ground. It did not explode in the air. However, there was no crater anywhere on the beach, and the column of smoke moves from side to side without growing in height, a physical impossibility. If the boys were killed by a munition with an impact fuse, where is the crater? There should have been a sizable hole in the sand between the Avenue Restaurant and Coffee Shop and the al-Andalus Wedding Hall and Restaurant. 6. There are only two types of eyewitnesses: those who saw three or four boys killed while running, and those who saw three to six running boys survive an explosion and arrive at the al-Deira Hotel. 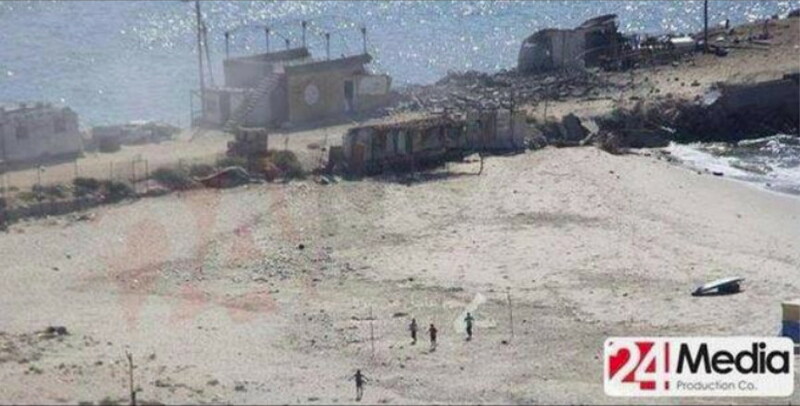 Not a single eyewitness reported seeing two groups of running boys who were both targeted by the Israelis. 7. The al-Deira Hotel was filled with journalists, photographers, and camera operators who said that they saw three to six boys and one or two adult males run three hundred yards/meters while being shelled by the Israelis. Not a single photo or second of video was taken of this incredibly dramatic event. 8. Mohammed al-Watfa made the following statement to the al-Haq human rights organization. However, photos and video show al-Watfa being loaded into a taxi at the al-Deira Hotel. 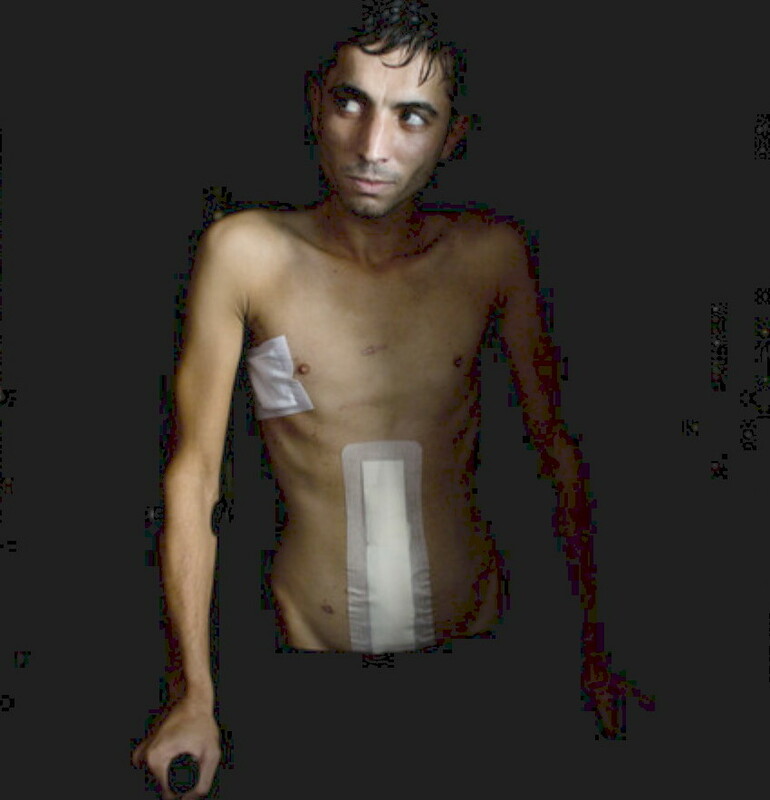 This is Fahd Abu Sultan. Though Mohammed al-Watfah says Sultan is a coworker in the coffee shop, other sources say this. Another man is also identified as Fahd Abu Sultan. He was seen being removed from a tent on the beach. Why did Mohammed al-Watfah lie about what actually happened to him, why is everybody lying about Fahd Abu Sultan, and who was the man removed from the tent on the beach? 9. 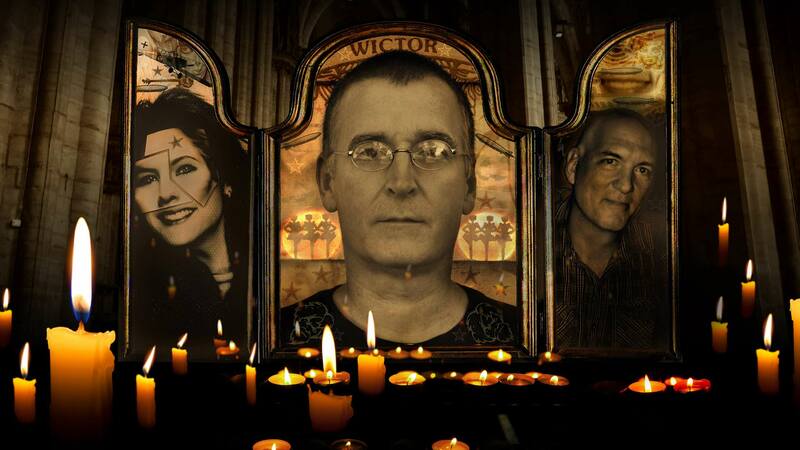 Why did the gaping wounds of the four dead boys not bleed profusely? The injuries weren’t cauterized by the heat of the explosion; you can clearly see that the exposed muscle tissue is unburned. 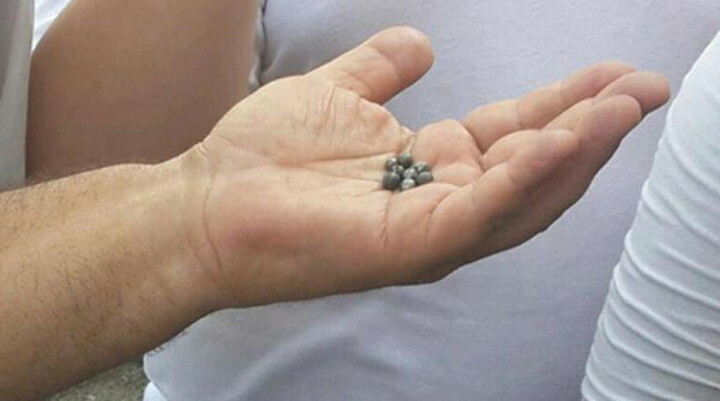 No IDF munition uses shrapnel. Air-to-surface missiles have fragmentation warheads. The fragments can look like this. If the warhead is pre-fragmented, the pieces will look like this. They produce jagged, uneven wounds, not round holes. 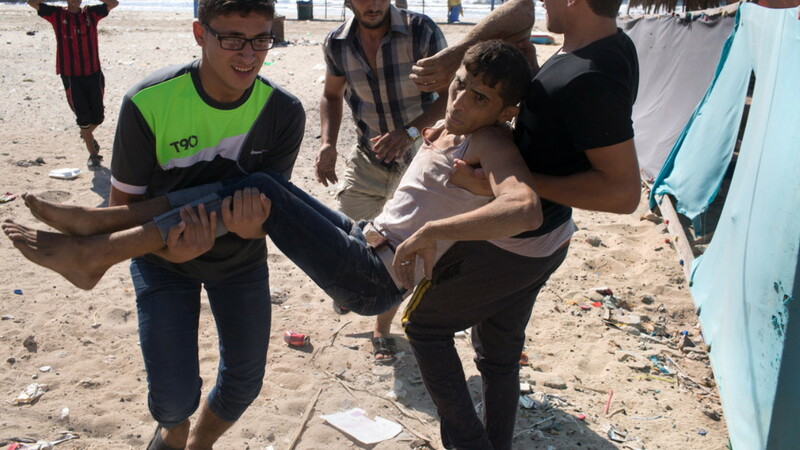 Why did the bodies of Mohammed, Ahed, and Zakaria Bakr have shrapnel wounds in them? Anyone can send me messages spluttering, “Nonsense! Balderdash!” How about you try to answer my questions instead? This article viewed 543 times.